Box from Rigid Industries Lighting showed up today. Thx to Brett Carpenter and Rigid for the donations. Took a ride out there today. Our normal area looks good. Only the road was washed out. Which I'm sure will be fixed before the playday. 4qt aluminum oil holder for your car. 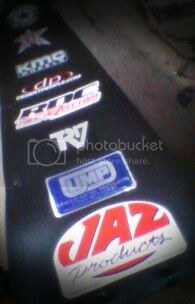 Thanks Cliff Campos at Unique Metal Products. Another prize for the prize bin. So how about a roll call. Who's going? With a car or without? And is anyone bringing food? The whole Pruett clan will be there with ...if everything works 2 bajas and a rail. Not sure on food yet. I will be out there Friday morning for sure.. I can get out there Thursday night if anyone is going to be out there. I am game for a "pot luck".??! Should be there unless something comes up with my little granddaughter. vwBOAT (john) BRINGING MY BAJA. I plan on attending also probally going out Friday nite! 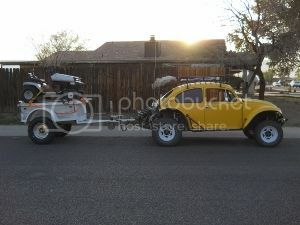 cody wants to bring his Quad and will pay for someones gas I have nowhere to strap it down on my rail lol! Alyssa and I will be there on Sat in the AM. Do not plan on over night this year. We are packing light. If it does not fit in the Baja it will not come with us. That is not much stuff. I am going to pre run the Hassayampa this Saturday 10/25/2014 @ 8 am. The Hassayampa River run starts at the waffle House at 83rd Ave. and McDowell we leave from there drive up to 339th Ave. Turn right to McDowell Road then we then take McDowell Road to the bottom of the Hassayampa River most non-Street legal vehicles meet us at this point. Then we drive up the Hassayampa River to Wickenburg the non-Street legal vehicles will turn around and go back down the Hassayampa River run while the rest of the vehicles going to Wickenburg for lunch then we take the constellation mine Road over to the Castle Hot Springs Rd. then exiting at the lake pleasant recreation area. This is a very easy run a stock Baja can easily make this event. Awsome I really appericiate that I don't know if Codys gotten ahold of you or not but thanks! Matt at mad media dropped me a line and will send out some mint 400 swag.